Buy Bio D Fabric Conditioner Juniper - 1litre in the UK from our online shop or directly from our independent Scottish store. Our effective conditioning formula and the rich, lively scent of fresh juniper combine in this fabulous Fabric Conditioner, which protects fibres and leaves your laundry soft and static-free. Suitable for use in automatics, twin-tubs and for conditioning delicate fabrics by hand. Automatics: Follow manufacturer’s recommended programme, adding 50ml of Conditioner to the machine dispenser. Twin Tubs: Add 50ml of Conditioner to a 1L jug of water, pour over the wash and spin. Hand Rinse: Add 50ml of Conditioner to a 1L jug of water and pour over the wash. Allow to soak before rinsing thoroughly in clean water. Where can you buy real Fabric Conditioner Juniper safely online? 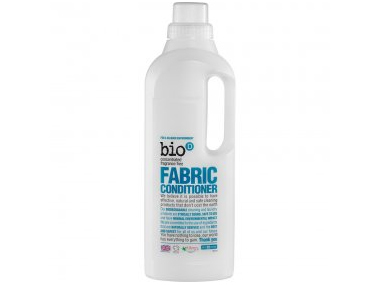 If you are wondering where you can buy Bio D Fabric Conditioner Juniper - 1litre safely online in the UK, then shop with us. Fabric Conditioner Juniper - Bio D Fabric Conditioner Juniper - 1litre in Cleaning & Laundry and Household.